With IEDs shattering the glass outside his Baghdad office and religious divisions among staff working within, Mohammed Qasim has quietly gone about his business of building the Iraq of tomorrow. 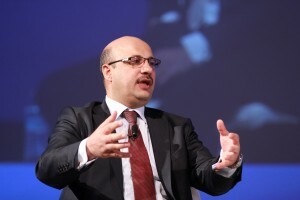 Mohammed Qasim, Executive Director, New Vision, shared the unique insight of an IT expert on the state of Iraq’s developing government. Qasim sells and installs enterprise content management (ECM) systems, the electronic records management software central to running administrative operations in Western enterprises and government offices for decades. Qasim is installing the software infrastructure now running the Iraqi Ministries of Oil, Justice and Industry along with the Iraqi Security Commission, that country’s version of the U.S. Securities and Exchange Commission. Qasim shared the singularly unique insight of an IT expert on the state of Iraq’s developing government. He talked about the technical and practical challenges of selling software in a country struggling with a fledgling government and deep cultural divisions, perched on the edge of one of the most dangerous political movements in recent history: the Islamic State. 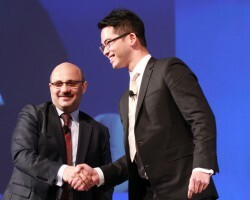 Mohammed Qasim with Sean Tang, Laserfiche Vice President of International Business. He spoke at the Laserfiche Empower 2015 Conference at the Anaheim Marriott on Thursday, January 15. For more information, please contact Andrea LePain at 617-894-1153 or alepain@greenoughbiz.com. 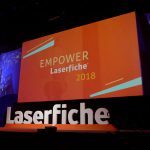 Each year, the Laserfiche Empower Conference brings together thousands of ECM enthusiasts from around the world. This year’s event took place at the Anaheim Marriott on January 13 – 16. 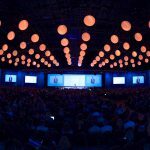 An impressive line-up of speakers from organizations including Gartner, the Center for Digital Government, the Texas A&M University System, Info-Tech Research Group, Bank of Beirut and Palm Beach, Florida, will lead more than 150 course sessions on ECM trends, strategies and best practices.